EVERY WEEK I take £5 to Ridley Road market in Dalston, Hackney, London E8 2LH, to spend on seasonal food, and on Friday I tell you what I have chosen and publish a seasonal recipe. Expenditure on any extra ingredients, eg, a litre of oil, will be recouped by usage over subsequent weeks. Some of the recipes will be frugal. They will all be tasty. Some meals will need additional ingredients. All will be vegetarian. NB: this website uses metric measures but some Ridley Road traders cheekily sell in imperial, some in metric and some also by the bowl. They all give good value. Equipment: oven and grill, mixing bowl, jug, rolling pin, pie dish, kitchen knife, paring knife, frying pan that can be used under a grill, saucepan with a steamer. I use a small loose steamer that fits several saucepan sizes, a grater and a potato masher. A strong fork can double as a masher. Boil potatoes in salted water until soft enough to mash. If you have a steamer, cook the shredded cabbage with the grated carrot above the boiling potatoes. If not, cook separately until soft in boiling water with NO salt. Save the cooking water for later (see tips, below). Meanwhile cook the thinly sliced onions in the oil until soft and translucent. Drain and mash the potatoes with the butter and add the cabbage, carrot and onions. Mix all together. Put everything in the frying pan, shaping to fit the round shape. Smooth the top and cook on the hob on a gentle heat until the bottom is crispy but not burnt. Transfer to a hot grill and cook until crispy. If you think the bubble and squeak needs livening up visually, add a little colour by frying an egg or two in a little butter to serve on top of it. Serves 2 for dessert. There will be extra for slices over the next few days for tea breaks. This is not a cheap dessert and uses ingredients outside this week’s £5. 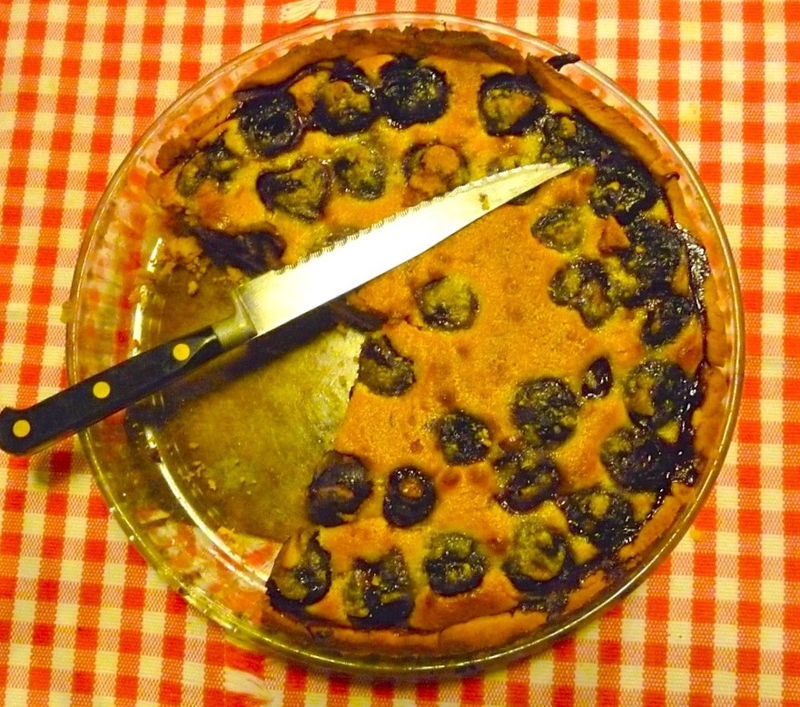 But cherries have such a short season that it seems a pity not to bake this pudding at least once during their season. 1 medium-size egg. I do not put sugar in this this pastry, but if you want more sweetness, add 55g of sugar. For me, the filling is sweet enough to compensate a lack of sweetener at this stage. Rub fat into the two flours until it looks like breadcrumbs and add the egg to bind, 3 or 4 minutes. Do not over-handle the mixture and when ready place the pastry in the fridge to rest. Meanwhile make the filling. Mix butter and castor sugar until a smooth creamy mixture. Add eggs one at a time with a little ground almonds. Add remaining ground almonds with the almond extract and mix thoroughly. Roll out the pastry to fit the flan dish. My dish is 24cm. Brush the dish with melted butter and place the pastry to fit. Bake blind for 15 minutes. Remove the pastry case from oven. Turn the oven down to 200c. Place the cherries evenly over the base. Top with the almond mixture and return to the oven and cook for 10 or 15 minutes until lightly coloured. I always have a little pastry left over and this I roll out and spread with Marmite then roll it up like a Swiss roll. Cut into pin wheels and bake for 10 or 15 minutes at the same time as the pudding. Jam can be spread over the cooked base before adding the almond mixture when cherries are out of season. A sprinkle of flaked almonds on top before returning to the oven gives a professional finish. My basket may contain what is often thought of as plain British fare but that is not quite the case. The onions will make a lovely warming French onion soup, and will also be used to add flavour to stuffed cabbage leaves and many other autumnal dishes over the next few weeks. I’ll also make a vegetable mornay, as well as my favourite potato and onion pie, which was taught to me in secondary school by a creative teacher of domestic science, as schools used to call cooking. 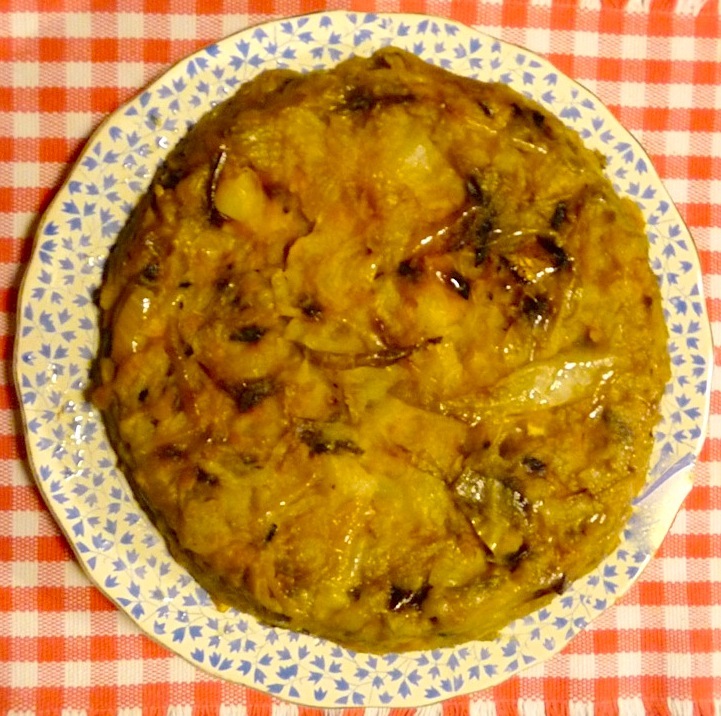 The cabbage will keep fresh in the fridge for a few weeks and used when needed. The remaining cherries will be gone before the day is out. Tips: Keep all vegetable water to use in soups and in cooking grains. Potato water is great for gravy-making. If it is not going to be used within a few days, freeze it. Do not keep bread in plastic wrapping because it can go mouldy. I keep mine in a cloth bag. It does not go mouldy but hard if left for several days. I put this stale bread in a blender (a coffee grinder is good, too) and whizz it so it becomes fine breadcrumbs. These are stored in an airtight container to be used when required. Keep the lid off the container until the crumbs are cold because the rapid blending makes them warm and the crumbs will sweat if not left to cool down.